The perfect jighead for soft plastic lures. The hook is made of High Carbon steel and is excelled by its wide curve as well as by its impressing stability. It resists also large predators. The extremely strong and chemically sharpened hook tip cares for a safe hooking also over long distances. 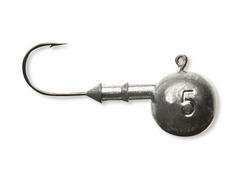 Especially when using light tackle, a fast penetration is of special advantage.